Scroll down for a traditional, authentic Black Forest Cake Recipe. Also find links to other popular dishes. Black Forest Cake is basically a devil's food cake soaked in Kirsch, and made with cherries, cherry pie filling, and a cream topping. The cake is often garnished with chocolate chips, or shaved dark chocolate. This Black Forest Cake Recipe has an endless number of potential variations. Line the bottoms of two 8 inch round pans with parchment paper circles. Sift together flour, cocoa, baking soda and 1 teaspoon salt. Set aside. Cream shortening and sugar until light and fluffy. Pour into 2 round 8 inch pans. Bake at 350 degrees F (175 degrees C) for 35 to 40 minutes, or until a toothpick inserted into the cake comes out clean. Remove paper from the cakes. Sprinkle layers with the 1/2 cup kirsh. Add confectioners sugar, pinch of salt, and coffee. Beat until smooth. If the consistency is too thick, add a couple teaspoons of cherry juice or milk. In a separate bowl, whip the cream to stiff peaks. Beat in 1/2 teaspoon vanilla and 1 tablespoon kirsh. Decorate with chocolate curls made by using a potato peeler on semisweet baking chocolate. 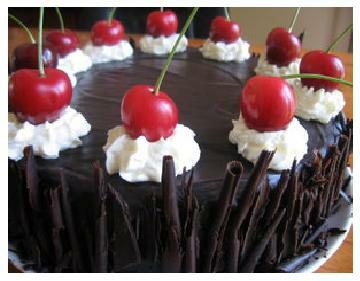 Enjoy your classic, authentic Black Forest Cake.